We begin by establishing an embodied and fluid relationship with our bodies, the breath, the floor, earth and space. We experience the ‘skinesphere’ – everything that is contained within the boundaries of the body – and the relationship of the body with gravity, the floor and the earth. We release our weight and mobilize our physical mass, allowing sensation, skin, surfaces of the body, weight and our connection to the floor to guide our motion and decisions. We explore yielding, rolling, sliding, creeping, pushing, pulling, crawling, finding supports. We learn how to sequence, spiral, flex and extend, moving from the spine and center to the limbs and peripheries. in and out of the floor. We explore high tone, low tone and we travel along the floor, up to standing and back down to earth again, expanding our awareness to include others and the room. We become articulate with moving in contact with a partner, gravity and the physical forces of counterbalance, support, touch and weight. We negotiate and navigate physical pathways in contact with each other. We explore being passive and active, receptive and directional, learning to trust ourselves and our our bodies and to read and respond to the physical information we are receiving in a moving duet. For all levels including beginners. In this class/workshop we will explore skill sets and tools which encourage and develop ease and confidence in seeing, touching, moving and dancing in contact with a partner. We will explore the relationship of vision, sensation, weight, space, range and intimacy. We will find ways to be fully present to our partners and the moment, drawing from a toolbox of skills that support us to be curious, flexible, engaged and responsive in our dancing. This workshop employs principles of the Alexander technique to become available and present physically and mentally within each dancing moment. Practicing some basic principles of the technique whilst dancing facilitates fluidity, the spreading and stretching of perceptions, oscillating range, becoming more available for sensory information and experiencing more support in our dancing. Taking the act of dancing as a starting place and as a foundation for relationship and observation of our experience, we practice the use of our eyes, our ears, our minds and bodies whilst we dance with our partner. We notice where we have our attention in any given moment, the kinds of information we are receiving, how we respond to it and how that changes the dance we are having. This is a dance of discovering fearlessness and trust, expanding range, becoming adventurous and discovering openhearted and committed contact. This is a revolving trio movement and contact score which can take place over two or three hours. It gives each dancer a luxuriously long amount of time to explore, eyes closed, their internal and external landscapes, physical processes and states. They are facilitated first by their two partners and then, as the score progresses, by other people in the room. Taking their cue from the soloing dancer, supporting partners offer touch, contact, mobilisation, weight, support and containment to the soloist who is able to move as they wish, in their own timing, and in their own way, with his or her partners and through the space. This score can assist dancers to arrive more fully into their bodies and into the space, whilst developing and strengthening their movement and contact with others in a deeply satisfying way. A shift takes place when contact improvisation as a form becomes a vehicle into dancing with another person with all the possibilities that this includes. This workshop is about using the moves, the skills, the exercises, the training, and going beyond them into dancing fully and deeply with each other, where the dance takes on a life of it’s own. We will practice cultivating a state of openness, relationship, trust, being finely tuned to many different sources and kinds of information, whilst being relaxed, present and responsive in our dancing. We will explore how the form and language of Contact Improvisation can become a a medium and a vehicle for communication and relationship with another person, their body, the earth, space and the physical forces. We will experience how the language of Contact becomes transformed, like words to poetry or musical notes to music, where something new and unknown can happen and we can trust and engage with the forces from within and without, that support the dancing and the dance. 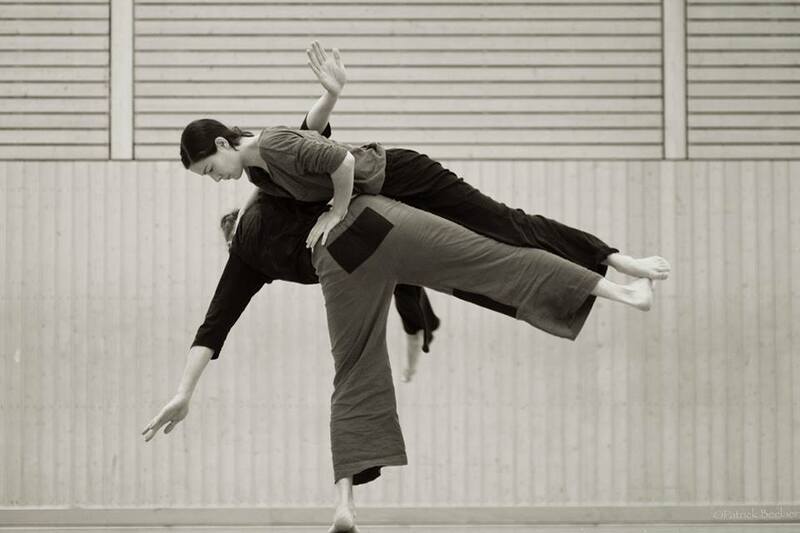 Juliet began dancing contact improvisation in 1983 in London and began teaching contact in 1988 in Oxford, England. She has taught contact improvisation workshops and classes in England, the Netherlands, Italy, Singapore, the USA, New Zealand and Australia. Her teachers include Julyen Hamilton, Kirstie Simson, Lucia Walker, Steve Batts, Chris Aiken, Nancy Stark Smith, Martin Keogh and Ray Chung.